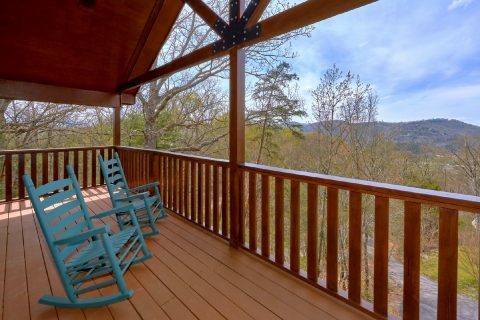 Stay at "Ah-Amazing" and experience a stunning Smoky Mountain honeymoon cabin in Sevierville! 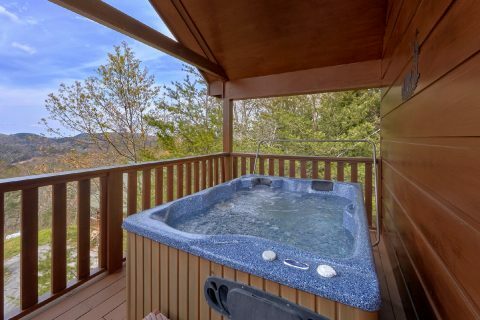 Imagine relaxing on the porch in the 4-person hot tub soaking in the warm, soothing water while watching stunning views of the mountains. 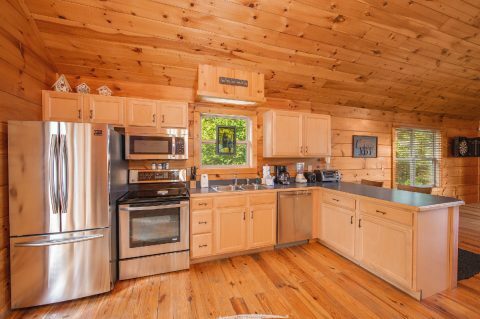 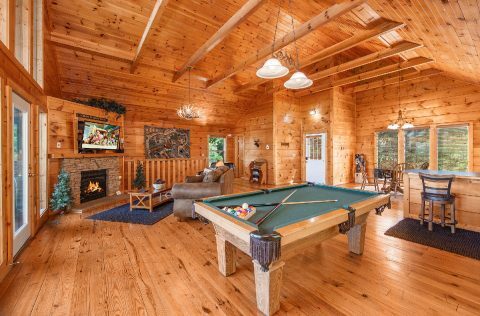 Inside your cabin, you can enjoy a friendly competition with games, full size pool table and dart board or snuggle up in front of stacked stone fireplace and watch TV in the spacious living room. 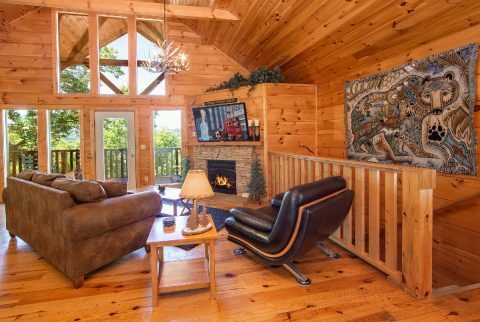 You can also record your favorite shows while you enjoy the sunset. 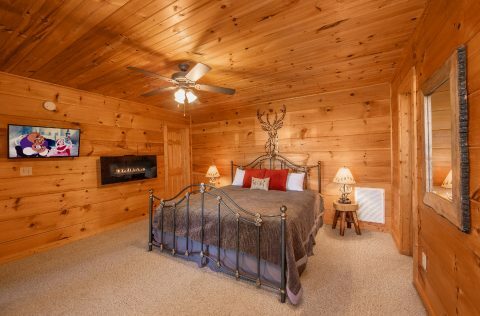 At the end of an action-packed day, unwind in your cabin’s relaxing bedroom that features an electric fireplace next to a king size bed. 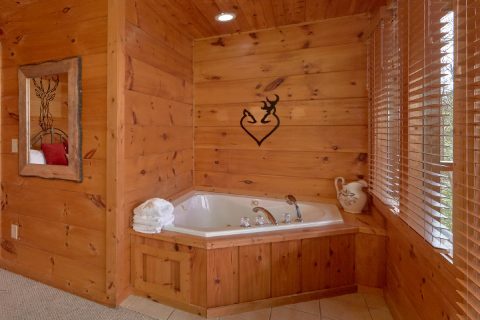 Soak in the in-room jacuzzi or watch TV. 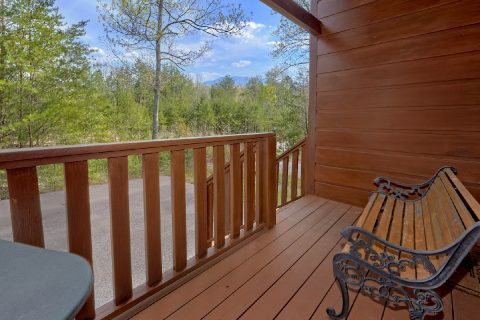 Wake up to your mountain view and simply escape from everything. 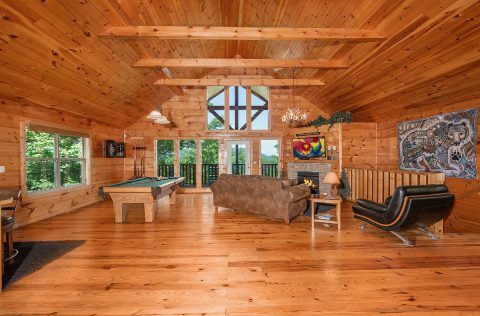 In addition to its luxurious bedroom, “Ah-Mazing” has a queen size sleeper sofa with down mattress in the living room that allows this cabin to accommodate 4 guests in comfort. 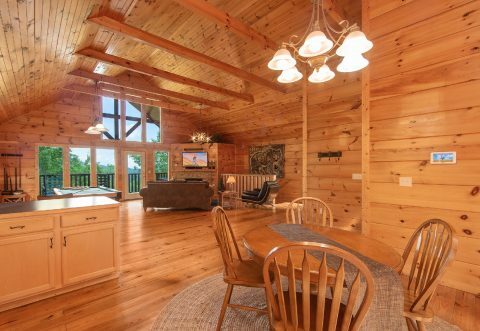 You can invite others to stay at a nearby cabin, ”Alone at Last.”’ This is perfect for groups traveling together who prefer more privacy. 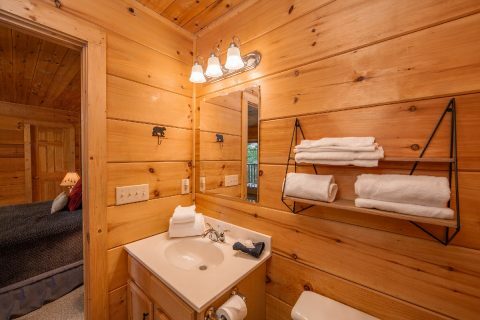 These two honeymoon cabin rentals can easily be booked together. 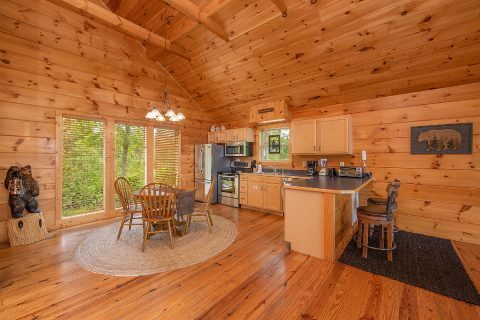 Simply call our office and we’ll be glad to help you with arrangements. 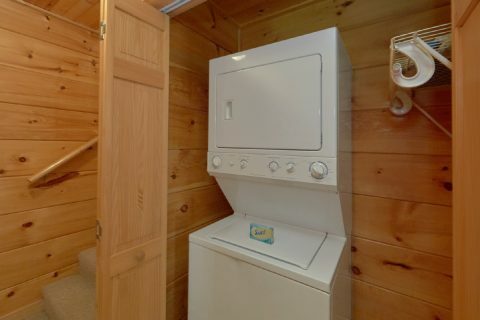 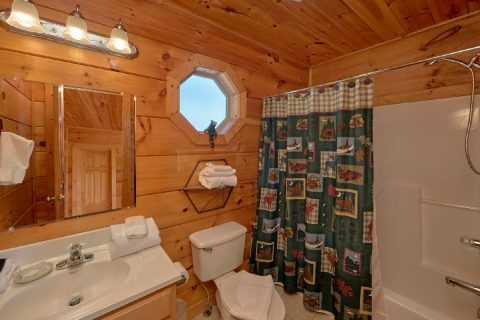 Other comfortable features of your cabin include two decks with rocking chairs, two full bathrooms on each floor, 2 parking spaces, and in-unit laundry. 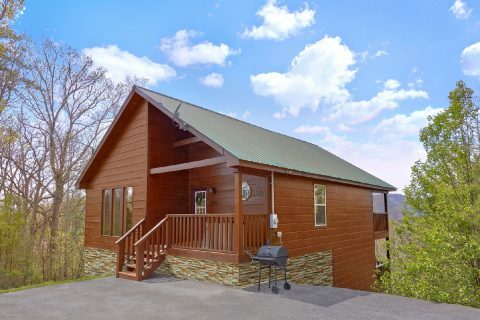 Come and enjoy the unrivalled natural beauty and hiking trails of the Smoky Mountains as well as dozens of entertainment options in Pigeon Forge and Gatlinburg when you stay at this “Ah-Mazing” cabin. 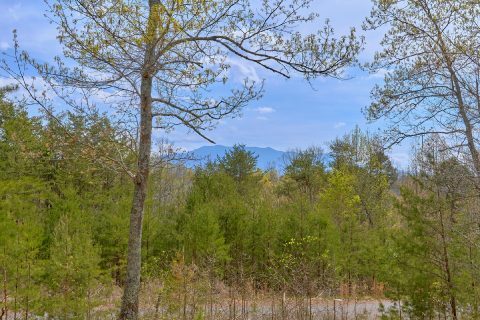 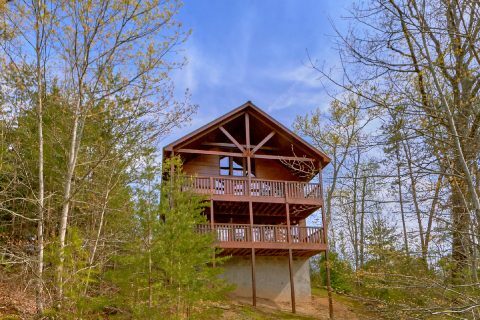 Book this one-bedroom cabin in Sevierville with fireplace, hot tub, stunning views, and more and enjoy a 15% discount when you reserve online!